The smallest detail can make the difference between a successful pallet design and a costly mistake. Designing packaging elements independently curbs innovation and limits chances for exceptional savings. Leaving equipment compatibility to chance opens the door for preventable mishaps and loss to happen. A manufacturer of porcelain plumbing supplies was seeing their profits go down the toilet. Literally. Damage rates were as high as 25%. A common mistake we find in damage cases like this stems from designing the packaging separately from the pallet. Our technical team knows that architecting the unit load as a system provides best results. After lab testing our new packaging system and running field trials, we reduced product damage to 0% saving this customer over $1 million. Packaging specifications seem to be changing at an alarmingly fast pace. Keeping up is becoming just plain overwhelming. We can help. The Nelson Technical Center has been assisting packaging engineers for decades. Reducing total cost of ownership with an eye towards sustainability is our core focus. We can help your company reduce damage, improve packaging or standardize pallets for improvements everyone in your supply chain will see. Our all-inclusive evaluation of current systems and processes takes place at your facility. The process can last several hours to a few days and concludes with our Opportunity Assessment Report. 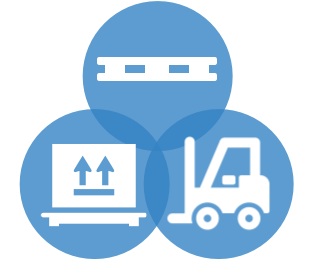 Imagine a perfectly load-balanced shipment that is properly sized, better protected and costs less. And, if you’re exporting, picture your freight sailing through customs inspections. Can your packaging hold up to the rigorous challenges of industrial shipping and warehousing? Controlled testing environments validate materials and designs. Consider us an extension of your team for helping to solve specialized problems, reduce waste and improve control in your transport packaging systems. When all three key elements of your packaging system work in perfect harmony, no one even notices them. That's how it should be. You want a transport packaging consultant that can solve your unique challenges and understand everything you go through on a daily basis. That's The Nelson Technical Center. We've been in your shoes. We manage and support transport packaging systems in ways that help your company save. Get realistic, expert advice from wood science specialists and packaging engineers for advancing your goals. We shift the focus from operations to strategy for optimizing savings opportunities throughout your system. Feeling Overwhelmed and Just Want to Talk? No Pressure. Questions are Free. Yes, Really! When it comes to packaging, there's very little we haven't seen before.